OxygenOS 2.1.3 update is now available for the OnePlus X android smartphone. The new OS update is packed with lots of bug fixes and improvement. 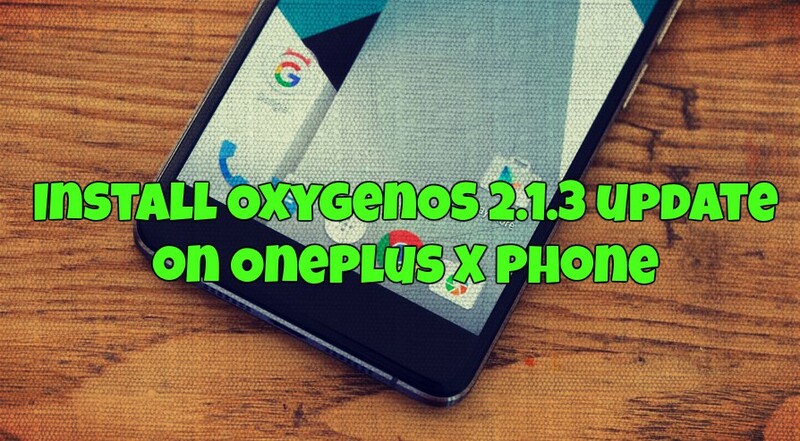 Here are details of the new Oneplus X OxygenOS 2.1.3 update SD card related improvements, UX improvements, Ability to move apps to and from SD card, Security patches, General bug fixes, and optimizations etc. The update is now live and most of the Oneplus X users already received the OTA update on their phone. This OTA will be rolled out incrementally and some of the users have to wait for the OTA update. IF you want to flash it manually you can do the same by following the below mention tutorial. The method is simple and takes few minutes to flash the new OTA zip file on the OnePlus X Phone. All you have to boot your phone in recovery mode and flash one zip file on the phone and you are done. This guide is only for the Oneplus X users and don’t use this method on any other Oneplus phone or any other android. Before following the below-mentioned steps take the full backup fo your phone and save it in some safe place. Step 1. Download the OxygenOS 2.1.3 OTA zip file here and move the file on your phone internal memory. Remember the location of the file. Step 2. Now turn off your phone and boot in recovery mode. Press and Hold Volume Down + Power button to boot in recovery mode. Step 3. Now your phone is in recovery mode. From here Select the option Install from SD card. Step 4. Now browse the OTA zip file that you saved on your phone in step 1 and select to flash it. Step 5. Now the flashing process will start on your OnePlus X and this will take some time. Step 6. After this GO back to the main menu and wipe cache and reboot the phone. Now your phone will reboot and your OnePlus X is running on the latest OxygenOS 2.1.3 firmware. Hello, thank you for your tutorial. But I always got an error. E: Error executing update binary in zip ‘sdcard/(path etc)’. pls does the google app work on my gionee p5 w eit version 5.1 and how do i install it?? Same to me …every zip File i tried it says” failed ” whats the problem ? why i can do the OTA ..or where i get the right on ??? Where i get the right OTA file ? ?